Scrum-half Chris Cusiter provided a spark for an ailing Scotland side following his debut against Wales during the 2004 Six Nations. Possessing a strong running game, incisive decision making skills and good delivery, he quickly made a mark at international level and was selected for the 2005 British & Irish Lions tour to New Zealand. On an unhappy tour, Cusiter impressed in the midweek side but was overlooked for Test recognition beyond a replacement appearance in the warm-up against Argentina in Cardiff. Following the tour Cusiter became involved in a battle with Mike Blair for the Scotland No.9 jersey and that, coupled with a string of unfortunate injuries, limited his appearances in following seasons. In 2009, following the appointment of Andy Robinson as Scotland boss, he was announced along with Blair as Scotland's co-captain, with Blair having held the role previously. 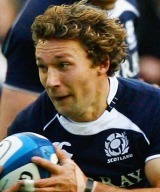 Cusiter's resurgence followed a starring role as Scotland 'A' won the IRB Nations Cup in 2009. In terms of his club career, Cusiter left the disbanded Borders club in 2007 for French Top 14 side Perpignan, before deciding in 2009 to return to Scotland and the Magners League with Glasgow Warriors. His 2011 season was largely wiped out by a knee injury but he returned for the Warriors' final games of the season, also agreeing a short deal to play for Southern Districts in Australia as preparation for the Rugby World Cup.